Yeah, I'd agree and say keep it nice and simple: between 25-50% drop off, minimum 30cm gap sounds fine to me. Low walls are 50mm high. Is this what we are looking at as a realistic arena design at the present point in the discussion?? (Possible arena size increase aside). That is exactly what I was hoping to do to my arena if this all goes through. peterwaller wrote: Thats a good idea Dave a quick statment of what each person would like the rule to be to see how close we are to a concensus. Drop off between 25% to 50% of arena perimeter. All other walls 2.5 to 5cm in height. Smallest dropoff gap to be 30cms. I agree with Peter's proposal above. This should give a well balanced arena that I hope will increase the level of robot diversity. I've particularly enjoyed competing in Andy's/Scott's arena with the additional midway low walls (AWS39) & Will's arena last year (AWS40) both of which I believe will be legal with this rule set. Drop off between 20% and 50% (with less obviously preferred). Smallest drop-off 20 or 25cm. All other walls 5cm minimum, no maximum. The reason I was suggesting all other walls 5cm max was to give the flippers a chance to get people over them. If all walls are full height there is little advantage in building a flipper over a pusher which was one of the things I was truing to encourage. I don't disagree at all, I would ideally like to see all arenas have some low walls, but as I've stated elsewhere in this thread, my own personal preference is to keep things as open as possible to allow people to experiment. That said, I'm perfectly happy with the other numbers people have opined, with the exception that I still think 30cm is too wide for the minimum drop-off width. Either way, I'm glad this is finally being formally discussed . Should there be a minimum thickness of wall? Otherwise these walls are going to get broken or bent and everything is back to square one. Scott, this discussion format is limiting. I'll talk to you face to face again. Since I already consider this passing a foregone conclusion, it may as well be tried. I still object though. Andy wrote: 4mm polycarbonate is the minimum recommended thickness. With no gaps greater than 2mm for safety. Which I agree should be added to the rule. It may be worth mentioning that polycarbonate with UV protection should be avoided, as this is more likely to shatter. I agree with Pete on the 5cm maximum wall height. Any more and you'll struggle to get people over, unless you have a spinner or pneumatics. i agree with making arenas with less drop of areas but not none at all. pushers are not the only robots that would be made less effective by less drop offs. crushers are more grab-hold-and-dumpers at this scale, as are axes. without drop offs this tactic becomes useless. induction fan robots would also be effected. even if they caught their opponents. where would they take them? but my main point is: ant events are packed already. making fights longer would make it even more difficult to stick to a time schedual. i agree with peter's design. between 25 and 50 percent drop offs. that still makes things fair for pushing and holding weaponry, the rest of the perimetre low walls. this would lead to some pretty cool flipouts. however, to make an even fairer playing field. i propose a wall height just low enough for a servo flipper to be able to throw one over. obviously they'd still need to be high enough to stop spinners flying over them, ( except in extremely powerful hits) to balance things out a bit for all forms of weaponry. something for everyone that way. a straight compromise. I agree with the last few posts, somewhere between 25% and 50% drop off is good in my opinion. Mostly the same reasons, to encourage variety, and to make the fights more interesting. I also feel that the "lowest front" feature is getting repetitive, so I am happy to modify the rules of the arena for less drop-off. I offer no apology for the length of the following essay. I feel it is important to provide some objective evidence and alternative views for consideration. Firstly I will explain how the current rules were arrived at and the intention behind them. Secondly I shall present some evidence which questions the assertions presented as reasons to change the drop-off rule. Thirdly I shall argue that the currently perceived problems are more to do with arena designs than the drop-off rule. Finally I shall discuss potential changes to the rules and my opinions on how they may affect future competitions. 3a) All battles must take place in a battle box, regardless of weapons being used in the battle. 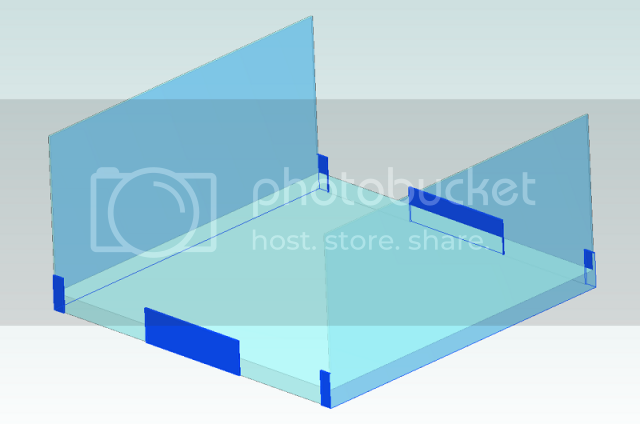 4mm polycarbonate is the minimum recommended thickness. 3b) The arena will be a raised platform with an area of at least 30 inches (762mm) square. 3c) At least half of the edge of the arena must be unwalled, to allow robots to drop directly into the ditch that surrounds the arena. 50mm is the recommended height for arena walls. 3d) The minimum distance between the edge of the unwalled part of the arena and the battle box (and therefore the width of the ditch) is 140mm. Rule 3a is for safety and I don't think anyone has any issues with this. Rule 3b is discussed elsewhere, but it is important to note that it only specifies a minimum area – this is significant to the current discussion. Rule 3c has always specified a minimum of 50% drop-off since antweights started. This is partly to ensure that pushers (with no active weapon) have a reasonable means of winning, but also many other types of robot rely on pushing an opponent out of the arena since with the exception of spinners most weapons do not scale down to antweight size and continue to do as much damage as their larger counterparts. The recommendation for 50mm high walls came about several years ago. If I remember correctly the intention was that arenas would have a ditch all the way around with up to half the arena walled to 50mm and the remainder a plain drop-off. I think the only implementation of this was Tim's arena used for the AWS(s) held in Eindhoven. All other arenas have implemented around 50% of the perimeter as a full-height wall. The intention of the recommendation was to make it possible for flippers/lifters to win at any point on the perimeter of the arena (albeit with some effort) whereas pushers could only win at the drop-off zones. It should also be possible for a vertical spinner to throw an opponent over the wall. With at least 50% drop-off all types of robot have a good chance to win by pushing an opponent out of the arena – whether by lifting, grabbing or just ramming. Rule 3d was originally proposed to be 150mm, based on the maximum dimension of a robot (141mm) plus some tolerance. It was reduced to 140mm to accommodate Peter Waller's arena at the time. In practice, no robot is going to be able to span the ditch and get back into the arena; gravity takes over and the robot falls into the ditch, even if its back edge does catch on the edge of the arena. Also, the rule specifies a minimum width; arena builders may make the ditch wider if they wish. Those proposing changes to the rules often assert that current arena designs favour pushers to a significant extent, and that this is leading to pushers dominating the field since they are more likely to be successful. If these assertions were true then pushers would dominate the results of recent AWS competitions. If pushers dominate the field and have an advantage in the arena then they should also dominate the results table. 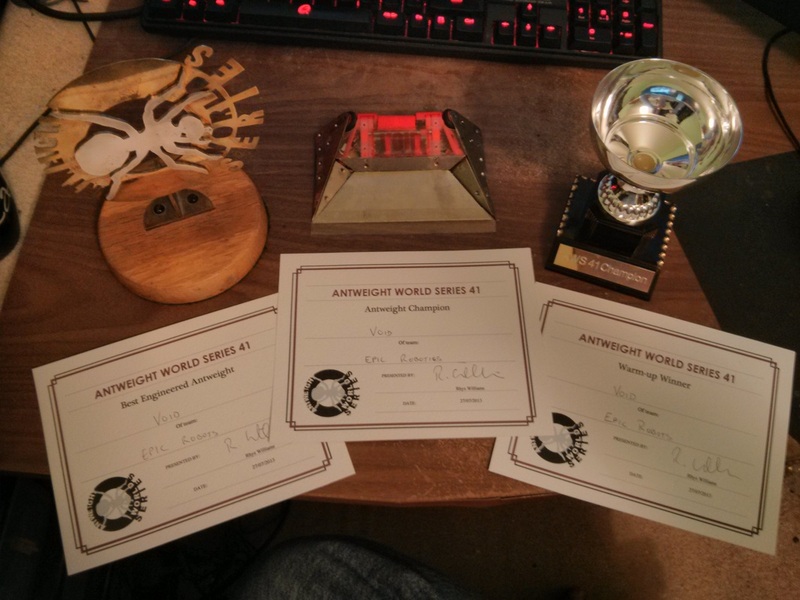 Having checked the top three robots of every previous AWS (thanks to Oliver) at http://www.antweight.co.uk/winners.htm I have failed to find very many pushers listed at all. On the other hand, some drivers do tend to dominate the results, implying that it is driver skill and/or robot design/build that are the dominant factors. By robot design I do not mean building a simple pusher, rather building a well-thought-out design of choice very well. There is no objective evidence to be found, but it is my observation that the assertion that a pusher can push any opponent in exactly the required direction is incorrect. It is only vaguely possible if the aggressor also manages to disable the opponent in some way, generally by lifting enough weight off its wheels that it loses traction. If it were possible for pushers to win so easily then every fight involving a pusher would be over at the first push. Whilst this does happens sometimes, it depends very much on the design of the two robots involved, one having a distinct weakness against the other. This discussion is supposed to be about the arena drop-off rule but most of the argument seems to revolve around shortcomings in the implementation of the rule in current arena designs. There is [b[nothing[/b] in the rules to say that the 50% drop-off has to consist of two complete sides of the arena. I have pointed this out several times in the past (see http://homepage.ntlworld.com/g0xan/robots/arena.htm) but do not feel I can push the point too far as I don't have the inclination to spend money on a polycarbonate battle box to house my arena. However, I am slightly disappointed that intelligent, creative people who build exceptional, imaginative robots all build arenas that are broadly the same, lacking in experimentation and variety. There are plenty of ways of spreading the existing 50% drop-off around 3 or 4 walls which would prevent at least some of the perceived problems with current arena designs. It is possible to have 4 corner walls, or all open corners. There is nothing in the rules to say that the arena has to have 90 degree corners, nor that it has to be even vaguely square or rectangular. I dislike current arena designs much like everyone else does. A sub-2-second fight isn't really much of a fight at all. However I believe this is more to do with current arena designs than the rules. I sincerely believe that if there were more variation in arena design within the current rules we would not be having this discussion! This is not a criticism of arena builders, rather a simple observation. The 'problem' with “the robot with the lowest front wins” will always be the case unless the arena surface were to be changed significantly. Antweights are light enough that they can run on two wheels and skid on the front edge. This means that a very low front is required to get under another robot, either to lift/flip or to force a loss of traction to enable pushing. I do not see that changing the amount of drop-off will have any effect on this. Many people seem to be basing proposals on minimum drop-off on the assumption that the minimum arena size is increased significantly from the current 30” square. This should not be a foregone conclusion. 20% of the perimeter of a 30” square arena is only 24” or 600mm. Implementing this as 2 x 300mm or 3 x 200mm would, I believe, make it very difficult for any robot to win by pushing an opponent out of the arena, thus significantly favouring vertical spinners and pneumatic flippers (assuming some low walls). Even with a much larger arena, say 1m square, a total drop-off of only 800mm would seriously disadvantage pushers and any other robot relying on pushing an opponent out of the arena. I do think there should be some statement of minimum gap and wall lengths, otherwise it is possible to make an arena with 90% drop-off that no robot could ever go out of! In practice it is very difficult to push another robot out through a 200mm gap. I really believe that reducing gaps to 200mm and the overall drop-off significantly below 50% would seriously tip the balance against pushers and other robots incapable of totally incapacitating an opponent or flipping them over the wall. As Dan (Hogi) has noted, many types of robots rely on pushing an opponent out of the arena to win, since several weapon types do not produce much damage at antweight size. Many people have suggested that the maximum drop-off should be specified, most often at 50%. I would question the need for this added restriction. No-one is forced to build an arena with 100% drop-off. I suggest that such a rule is redundant, and if someone wants to build an arena with more than 50% drop-off let them. Variety in arena design is important (and currently missing); limiting the maximum drop-off does nothing to help. In addition to a fear that the proposed changes will tip the balance too far in favour of powerful spinners and flippers, I worry that significantly reducing the amount of drop-off will lead to more stalemates requiring judges' decisions (often controversial) and consequently a greater reliance on judges and judging. Note that the last point remains a recommendation so existing arena designs are not made “illegal”. assuming two completely walled sides and two open sides. Should the drop-off scale strictly with arena size? The current rule definitions do not specify arena size (only minimum) and the drop-off scales with the arena perimeter. Is this the best solution? Should the minimum drop-off be defined as a (total) distance, say 60” (50% of the minimum size arena)? Should it be defined as “x %, with a minimum of y mm”? 1: I'd like to second Gary's point entirely, and add that I personally would consider it a moral duty of arena builders to provide us with a reasonably varied set of arenas to fight in - in an ideal world, that way we could ensure no one design could ever be favoured by the arena. As a suggestion - something I've pondered for a while but been unable to build due to being poor and useless - how would the rules look upon an arena that had all four outer walls completely enclosed, but a large central pit that served as the dropoff? 2: As much as I can agree with the desire of some people (specifically you Scott - no offence meant, I understand the e-sports analogy perfectly even if I don't believe that's what we should be emulating and you are a nice and reasonable person) to have a perfectly balanced competition, I am very concerned that the fun and essence of antweights could be in danger of being buried underneath too many rules, and the accessibility that sets us apart might be lost in the quest for a "better" competition. Wow that was some post there Gary. I must admit you make some very good arguments and the best of which I find impossible to argue against are the results. What was most surprising although it shouldn't have been is that Andy and Scott two of the most outspoken critics of the drop off rule have between them won 9 out of the last 16 AWS's all with non pusher robots and some of the ones they didn't win were won by flippers or a spinner. In the last AWS my flipper won 6 fights and my two pushers combined only won 7 so as you say the facts don't fit with my perception especially when you consider invertible pushers are easier to drive. I do think it is a little inconsiderate of you Gary to destroy my heart felt if misconceived reason I thought my spinners were doing so badly . In veiw of this I think a good compromise would be to use your suggested amendment below.